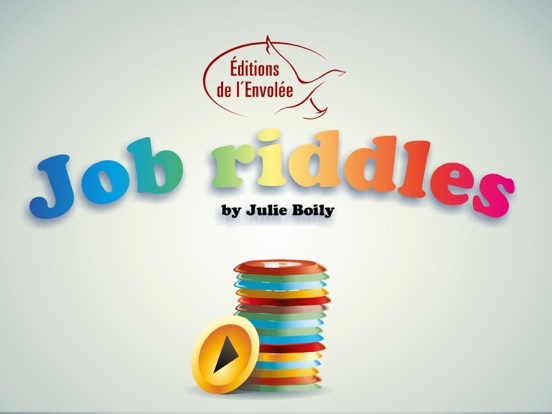 Easy to use, Job Riddles is created especially for children. The game is divided into 16 exercises, each containing a series of images and a description of a Jobs. At the bottom, There is an indication of where you are in the app. The exercise presents sixteen drawings of sixteen descriptions of a character and his job. Each text scrolls horizontally across the screen alongside the sixteen drawings. The job which corresponds to the description must be identified by a letter. Once the job is found, the letter must be slid above it. If the answer is correct, a signal appears. Otherwise, the player passes on to the next text or the game has to be restarted. Once all sixteen drawings have been identified and each letter is in place, the game is complete. At Les Éditions de l'Envolée, we produce innovative edutainment applications for children that stimulate learning to read. We develop and publish educational applications for interactive whiteboards (TNI) and for tablets, as well as reproducible teaching materials for elementary and secondary students. We cover most subjects, including mathematics, French, English, Spanish, science, ethics and religious culture, social sciences, and others. We also produce and publish literacy collections such as Du Plaisir à Lire, Être and Info Conte, which accompany children in learning how to read. Other Apps by 2953-8121 QUEBEC INC.